Accessibility is essential for every system or product in order to guarantee equal opportunity for access and use to all, including the differently-abled. Thus it is crucial to remove any technological barriers for special needs users, who explore the Internet by assistive technologies. However, ensuring efficient and satisfactory (in other words, usable) interaction with user interfaces (UIs) of products or services must occur in the design phase, in order to produce UIs that are universally simple to understand, rapid and easy to use. Applying accessibility and usability criteria from the very beginning of the design phase is much less costly than introducing it later, so specific guidelines should be followed from the earliest stages of the design process. In the long run, creating accessible and usable Web UIs will improve overall efficiency and effectiveness of interaction for any individual and organization. Every day the Internet brings new communication, informational and learning experiences to rapidly expanding user communities. 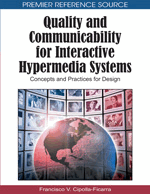 Interactive and hypermedia applications are increasingly applied in contexts ranging from news and thematic blogs to on-line libraries and structured educational content. Furthermore, new Web 2.0 applications such as Wikipedia or Facebook encourage the active participation of users worldwide, in a collaborative and cooperative way. This opens extraordinary vistas for the differently-abled, provided that interactive systems and content are properly designed and delivered. Accessibility is a basic requirement for every system or product in order to guarantee equal access, opportunity and use to all, including the differently-abled. An accessible Web also helps people with disabilities to participate more actively in society. “The Web is an opportunity for unprecedented access to information for people with disabilities. That is, the accessibility barriers to print, audio, and visual media can be much more easily overcome through Web technologies” (World Wide Web Consortium [W3C], 2005). Thus it is crucial to remove any technological barriers for special needs users, who explore the Internet and interact with multimedia content by assistive technology, i.e. HW and SW that allow one to operate computers and applications. The type of assistive technology used varies according to disability. For instance, the visually-impaired use screen readers (with voice synthesizer and/or Braille display) or magnifiers (for low-vision users). Motor impairment requires the use of special input devices, and so on. An accessible user interface must consider all of these needs in order to allow universal access. Thus, developers can only implement good design by becoming aware of all the obstacles encountered by users aided by assistive technologies. Likewise, making interaction with the user interfaces (UIs) of products or services effective, efficient and satisfactory (in other words, usable (International Standard Organization [ISO], 1998) is another pillar of the design phase (Nielsen, 2001; Norman, 2004). When designing for the differently-abled, who have reduced sensorial abilities, it is necessary to consider the three main interacting subsystems of the Model Human Processor: the perceptual, motor and cognitive systems (Card, Moran & Newell, 1983). Since websites and hypermedia applications have increasingly complex UIs containing embedded movies, audio, and graphics, the main goal is to provide mechanisms for delivering content according to user ability. Applying accessibility and usability criteria from the very beginning of the design phase is much less costly than introducing it later, so specific guidelines, such as Web Content Accessibility Guidelines - WCAG 2.0 (W3C, 2008c), should be followed from the earliest stages of the design process. In the long run, creating different ways of delivering multimedia content according to user ability will increase efficient and effective interaction for any individual and organization, regardless of time, place or pace.